Digitimes Research estimates total shipments of smartphone application processors (AP) worldwide will grow 1.5% on year to 1.67 billion units in 2018. 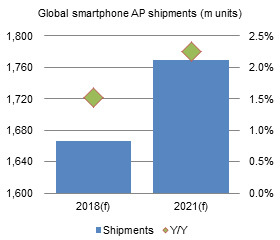 The slowing growth in the smartphone market means global smartphone AP shipments will only grow at a mild pace in the next few years, reaching 1.77 billion units in 2021. The report shows that Qualcomm will continue reigning at No. 1 in terms of vendor rankings in 2018, followed by MediaTek. But in-house-developed chips by Apple, Samsung, and Huawei (Hisilicon) will see their share of shipments grow to almost 30% in 2018. Digitimes Research estimates total shipments of smartphone application processors (AP) worldwide will grow 1.5% on year to 1.67 billion units in 2018. 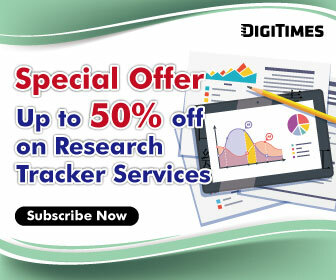 The slowing growth in the smartphone market means global smartphone AP shipments will only grow at a mild pace in the next few years, reaching 1.77 billion units in 2021, according to Digitimes Research's latest Special Report - Global AP market, 2017-2021, which provides insight into various aspects of the market. Qualcomm will continue reigning at No. 1 in terms of vendor rankings in 2018, followed by MediaTek. While the top-2 AP vendors are unlikely to see threats of being unseated, in-house-developed chips by Apple, Samsung, and Huawei (Hisilicon) will see their share of shipments grow to almost 30% in 2018. Except for Samsung who sells to outside clients a small quantity of its in-house-developed chips, Apple and Hisilicon produce processors exclusively for use in their own smartphones - the iPhone for the former, and Huawei's devices for the latter. As they are the world's top-three smartphone vendors (Apple, Samsung and Huawei), their growing presence is creating strong pressure for processor vendors. It is estimated Qualcomm will show a 1.5% decline in total 2018 shipments. MediaTek's customer base does not overlap much with the device vendors using their own chips and MediaTek has introduced competitive mainstream processors which have been adopted by downstream smartphone vendors. As such, MediaTek is expected to see a 2.1% increase in 2018 shipments but it may have difficulty reaching its 2018 goal of shipping 400 million chips due to slowing growth in the smartphone end market. In terms of processor architectures, Cortex-A53 remains the mainstream, followed by in-house-developed architectures. As to manufacturing process technologies, 28nm node is still the dominate node, maintaining a major share. The manufacturing of processors for flagship phones will advance to 7nm, 10nm and 12nm nodes, resulting in a drop of the 16nm node's shipment share. The 14nm node's shipment share will rise marginally as Samsung expands its adoption of in-house-developed APs. Smartphone AP developers are scrambling to add deep learning capabilities to their offerings so that they can perform edge computing in line with the rising artificial intelligence (AI) trend. Smartphone APs supporting heterogeneous computing with graphics processing units (GPU), digital signal processors (DSP) or neural network processors are growingly popular. It is estimated 26.9% of smartphone AP shipments worldwide will have deep learning inference and even training capabilities enabled by heterogeneous computing in 2018.